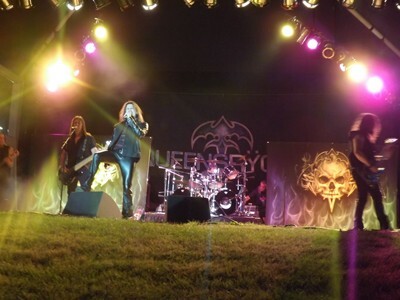 Queensryche roared into McHenry’s annual Fiesta Days at Petersen Park with openers Blackened, a Metallica tribute act that (from a distance) sounded like the real thing, and Jack Russell’s Great White, one of two bands currently touring under the Great White name. So an amazing late afternoon/evening of music was ahead, getting ready for the ‘return’ of Queensryche. 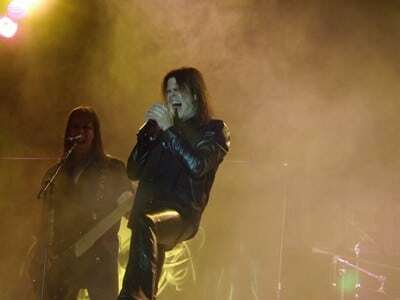 Currently Queensryche is on their ‘Return To History Tour’, playing unique venues — some for the very first time. This is great for long time fans of the band, like myself, who can see them in a different setting than a theater with assigned seating, or one of those old school amphitheaters where you may see the band mostly on a huge monitor. Those venues were never much fun. In this case, Petersen Park was ideal! Further exploring of the place revealed a full beach area, a perfect sunset over the water, and many photogenic areas to photograph while listening to Jack Russell sing his Great White hits. One of the highlights of his set was hearing the Led Zeppelin classic “The Immigrant Song” performed to perfection. Considering all of the Great White drama, and Russell‘s health issues, his voice was in as good of form as it was in 1991. I managed to meet him and chat for a few minutes before my interview with Queensryche — he was such a nice guy, whose voice is finally back in 100% shape. The entire audience sang along with “Once Bitten, Twice Shy”, and many in the crowd knew the majority of his set as well. The crowd grew considerably for Queensryche as the sun set over the park. The press, with their cameras, were allowed to photograph the set so for the first three songs, “Queen Of The Reich”, “Speak”, and “Walk In The Shadows”, I spent only a few feet from the band with about four other photographers. I’d compliment the stage designers, it was probably the most unique ‘in the grass’ feel I’d see any band perform on. From certain distances and views it appeared the band set up in the grass, in a park, and just got on with their set. Petersen Park proved to be the best venue I’ve seen live music at as the sound traveled all the way to the parking lot, with crystal clear sound. The band itself was literally on fire! The audience sang along with many of the songs, as video cameras taped, and cameras flashed from a distance. Not one person minded that the band now has a different singer. 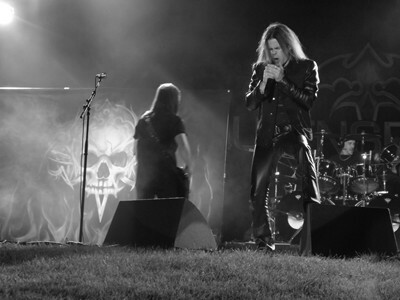 Many of the loyal Queensryche fans cheered Todd La Torre out of the park with adoration. The band seemed relaxed with their new found revival, and the audience couldn’t get enough of guitarist Parker Lundgren, bassist Eddie Jackson, drummer Scott Rockenfield, and lead guitarist Michael ‘Whip’ Wilton. For many it was their first time in the Chicagoland area to see their favorite band in a more accessible setting and atmosphere. More groups should try this out, instead of making their fans watch TV monitors at concerts. 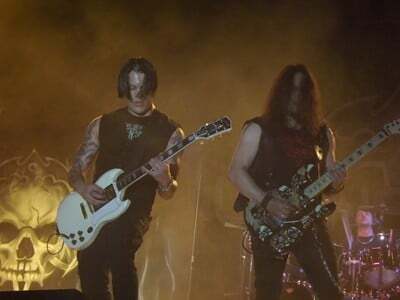 Queensryche brought three new songs with them, which were very well received by the audience. “Redemption”, “Fallout”, and Lundgren‘s “Where Dreams Go To Die”. The songs were instantly recognized as all appear on the band’s self-titled smash hit ‘reboot’ album. I even saw several in the crowd singing along with the new songs, as if they knew them by heart already. The rest of the set was similar to other stops on the tour. I would suggest, though, that they tweak the setlist a little more going forward. It would make a cool statement for La Torre as lead vocalist for this re-booted Queensryche if the set rotated slightly to included surprise cuts from ‘Q2K’, ‘Hear In The Now Frontier’, and maybe a song from ‘Operation: Mindcrime II’. Personally, I would’ve come unglued cheering if something like “Liquid Sky” or “Spool” was inserted one night of the tour, or if they played their cover of Iron Maiden‘s “Wrathchild” again as they did during the first three shows with La Torre. Its surprises like this that will keep them feeling like a revitalized band — an ‘Oh My God, they’re playing something off ‘Tribe’… with Todd!’ moment would go a long way. The performance was near flawless. They are closer to the perfect rendition of their debut track “Redemption”, which so far has been tricky to get down live — but it’s getting there! La Torre is the ideal frontman for this band — he’s so gracious to the audience and treats everyone as if they were old friends. No one around me, in any of the many places I stood in the crowd, mentioned the other singer’s name. 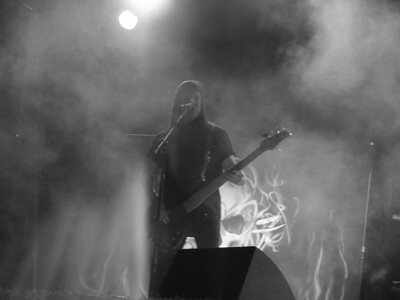 The general vibe was ‘this is Queensryche now…’ as that same sentiment was apparent all throughout their 90 minute set. Overall ‘Take Hold Of The Flame”, “En Force”, and “Child Of Fire” were the finest sounding, and again, this venue had a flawless sound system to add to the mix of an amazing band and super cool stage setup. To Queensryche I’d recommend, for their full-on tour coming up, to try and dig deeper into some of the later albums. Give those songs an appearance every so often to give fans a pleasant surprise every so often, and to change people’s opinion of those later albums by hearing them sung by new powerhouse vocalist La Torre. It was truly amazing to hear “Queen Of The Reich” live — the YouTube videos from past shows don’t do the song justice until you’re hearing the real thing live. In the first 45 seconds of the song you really begin to wish La Torre had been with Queensryche since 1982, and glad he’s here now — alongside Parker and the other three original members. This is a new beginning for a timeless band.